The San Antonio Spurs will take on the Dallas Mavericks on Wednesday night in the last day of the 2018/2019 NBA regular season. The Spurs (47-34, 31-9 home) have a lot to fight for in this final game of the regular season. The Spurs can finish between 6th and 8th in the West, and it is particularly crucial to avoid finishing 8th in order to avoid the mighty Warriors in the first round. A win tonight will guarantee that for the Spurs, so they will be pumped up to get that W. The Spurs have been playing well in the closing stages of this regular season, winning the last 2 games and 3 of the last 4. The Mavs (33-48, 9-31 away) are coming after an exhausting game last night (a win vs the Suns), particularly mentally. It was Dirk Nowitzki’s potential last ever home game, and the entire game was a celebration of the Mavs` best ever player. 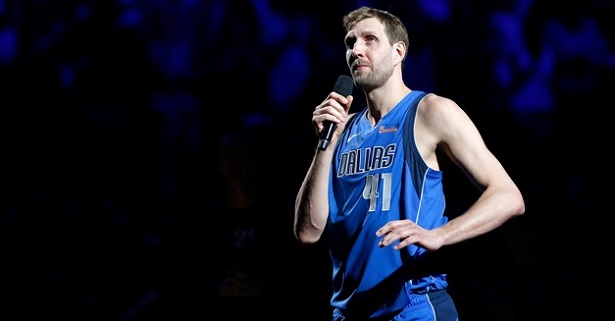 After the game, Dirk finally announced his retirement in a lengthy and emotional ceremony. Bet on Spurs vs Mavs and claim your 100% (120 Eur) welcome bonus at LSbet now! Spurs: The Spurs are fully healthy with the exception of Murray, who has been out all season. Mavs: The Mavs will continue to miss Porzingis, Barea and Hardaway Jr, while Antetokounmpo and Lee are doubtful. It`s possible that other players like Doncic will be limited in minutes, but there are no official reports about that. Dirk Nowitzki will play his final career game, but probably just a few minutes out of respect for the Spurs organization and their fans. The Mavs will likely be exhausted tonight. Yesterday was their big moment with Dirk playing his last home game and announcing his retirement. It was a long night, emotionally draining, and with players having to stay an hour or so on the court after the game ended. Traveling to San Antonio after all that was surely the last thing anybody wanted, even if the two cities are less than 300 miles apart. The Spurs on the other hand will come out firing and pumping on all cylinders, because if they lose this game they will probably finish 8th. That would mean facing the Warriors in the first round of the playoffs as opposed to (probably) the Nuggets. So it would mean an almost guaranteed early elimination, as opposed to having real chances to advance against the Nuggets. The Spurs would be favorites to win big at home against the Mavs anyway, given how good Spurs are at home (31-9) compared to how bad the Mavs are away (9-31). But given the huge difference in motivation, as well as the Mavs being tired after a long night, a blowout win for the Spurs looks even more probable. Look for the Spurs to put on a clinic against a weakened, tired and unmotivated Mavs team. My tip will be San Antonio to cover the -14 (asian) handicap. Prediction: San Antonio Spurs – Dallas Mavericks 123 – 98.